Global Knives are multi-award-winning knife sets, manufactured in Japan to highly exacting standards. 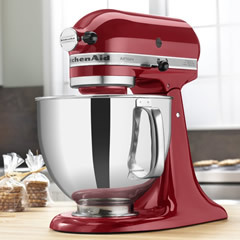 They are relied upon by renowned chefs, used in commercial kitchens, and are also available for t“e serious home chef. A Global knife set provides every blade you need in the kitchen, from paring knife to vegetable knife and utility knife, or you can buy individual Global knives, accessories, and the Global knife sharpener. The knives are such high quality that they include a 30-year warranty, and by following the care guidelines that Global provide, you can enjoy a lifetime's use of these high quality chef knives. 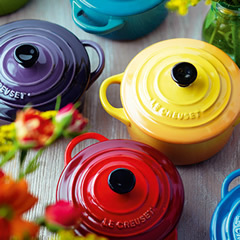 High quality and reliable kitchenware makes cooking more enjoyable and easier. A good kitchen knife makes slicing, dicing, cutting, and chopping easier. Depending on the type of knife, it may also be used for specialist actions like filleting and coring. At ECookShop we have a large selection of Global kitchen knives. 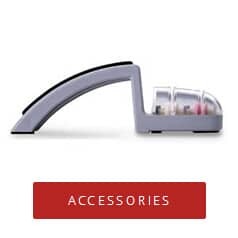 We sell different types of Global knives set, as well as accessories like the Global knife sharpener, peelers, and many other items. Join the likes of Michel Roux with your Global kitchen knives. If you place an order of more than £50, we will deliver your items to your UK address completely free of charge. Global Knives are among the best all-rounders on the market. They offer the highest quality steel and supremely sharp blades. There's a Global knife for every purpose, and you can either pick up a Global knife set, or buy G-Series, GSF-Series, and NI-series knives separately. 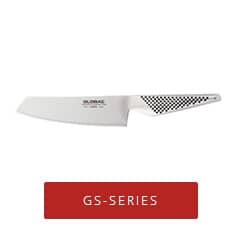 The Global G-Series collection is one comprised of large knives and 'must-haves' such as the 16cm boning knife, the Global GSF-Series is one comprised of smaller knives such as the curved peeling knife, and the Global GS-Series is one comprised of small and medium-sized knives such as the 9cm paring knife. 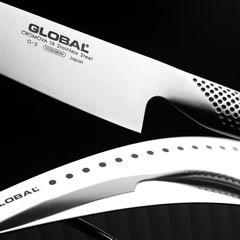 The Global NI-series features knives that are made by skilled Japanese craftsmen in the Yoshikin factory. They are used by Japanese restaurants all over the world. Whichever knives you need for your kitchen, you can expect the highest quality from Global, and if you are looking for value, a Global knife set is thoroughly recommended. Check out our full range of Global knives below, and save money in our Global knives sale. 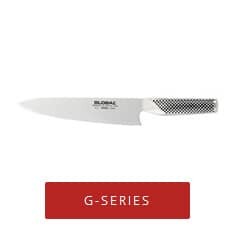 Made to the exacting standards of Japenese craftsmen, Global's professional chefs knives have remained some of the most popular and successfule kitchen knives in the industry for 30 years. Global is a Japanese brand of high-quality, stainless steel knives. The brand is own by the Yoshida Metal Industry Co Ltd, in the Yoshikin factory. Global knives are made from a much stronger steel than European steel. This not only makes the steel harder wearing, but it means that the knives can be sharpened to a finer point and with a thinner, sharper blade. Global launched in 1985, as a subsidiary of Yoshida Metal Industry Co Ltd. The knives are manufactured in the Yoshikin Factory, and the business is owned by the Watanabe family. In 1960, Yoshida produced a range of Bunmei knives, made from an alloy of steel that was considered as easy to sharpen as existing steel but made from a combination of molybdenum and vanadium. This Japanese steel is more resistant to rust, and in 1985, the first Global knives were launched to an international market, starting in Germany. Most recently, Global has expanded its range to incorporate new and innovative cutting solutions. You can buy specialist knives like tomato and crab Global knives in the UK. The G and GS Series of Global knives are traditional Global knives. They are lightweight, which is achieved using hollow metal handles, and this gives them a more traditional Japanese knife feel. 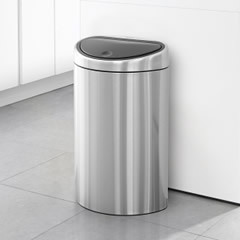 The G Series has a traditional shape handle while the GS Series has a triangular handle. Both of these series offer high quality Global knife sets, so choosing the knife for you is a question of picking the handle and the design that you prefer. GF and GSF Global kitchen knives are heavier. 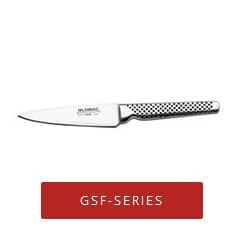 This European style blade is preferred by a lot of chefs because of this additional weight, and if you want a high-quality kitchen blade that will last for years to come, then the GSF Series is a good choice. 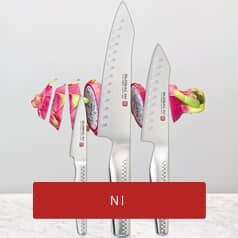 The Global knives Ni series is different to the other series. 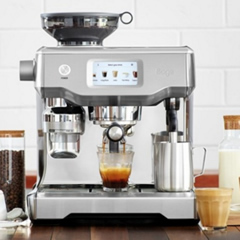 They have a longer handle and a new shape; both of which have been designed and incorporated to give the user much greater control and precision over what they're cutting. The blades are thicker, but the overall unit still has a lightweight feel, thanks to the CROMOVA stainless steel. Like all knives from Global, the Ni Series knives have a hollow handle, filled with just the right amount of sand to create the perfect balance. Global has made a reputation for crafting some of the finest kitchen knives available. As well as the sets of knives above, they also manufacture and supply accessories and other kitchen items. You can buy kitchen shears, vegetable peelers, serving tongs, and even a Global pen knife. These items, including the knives and the accessories, are made to be lightweight while benefiting from the use of the same innovative CROMOVA 18 Stainless Steel. Magnetic racks not only provide a convenient means of safely storing the knives, but they also offer a modern, quality look to the kitchen. Sharpening blocks and whetstones can be used so that you can maintain the high quality cutting that you first enjoyed when you bought one of these knives. What Are Global Knives Made Of? CROMOVA 18 Stainless Steel was developed specially for Global. It is a mixture of chromium, (CRO) molybdenum (MO), and vanadium (VA). It is a tough and durable steel that will retain its strength but is soft enough to be able to easily sharpen using a whetstone. This convenient and high quality combination is what makes the pieces in our Global knives sale such high quality. All Global Knives are covered by warranty, so if you do happen to get a knife that has a manufacturing defect or a defect caused during the production and supply process, you can exchange it. The quality and strength of CROMOVA 18 stainless steel also means that a lot of the products also include a 30 year extended warranty. As with most warranties, there are certain things that the warranty does not cover. Dropping the knives onto a hard surface or using them on frozen food can invalidate your warranty because this is not what kitchen knives are designed for. Always take care to store your knife sharply. Global kitchen knives are sharpened at an angle of between 10 and 15 degrees, which gives a finer and sharper finish to the blade, so they can easily cause injury if stored incorrectly. What's more, poor storage of your knives is likely to lead to them becoming damaged or dull. A Global knife block will help you store your knives safely and easily. Use a mild dishwashing detergent and water, and wash your knives by hand. Do not soak before washing, and always ensure that the knife is dried thoroughly before it is put back in the block. Can I Put Global Knives In The Dishwasher? Global knives should never be placed in the dishwasher. The sharp edges of the blade can come into contact with other items, and cause them to dull. The extreme heat and the strong detergents that are used in dishwashers can also cause damage to the CROMOVA 18 stainless steel. Poor cleaning can lead to rust, and poor washing habits can lead to damage to your knives. Can You Sharpen Global Knives? The unique CROMOVA 18 material offers an extremely sharp blade and also ensures that the sharpness is maintained much longer than with other knives. Despite this, they will need regular sharpening if you want to continue to enjoy the high quality and ease cutting that is offered by this innovative and popular brand. Choose between ceramic and waterstones. Waterstones need to be soaked for up to 15 minutes before sharpening, while a ceramic stone only requires around 5 minutes. Ceramic is harder than waterstone, so it will sharpen more quickly, but a ceramic stone will last longer without becoming damaged or worn. You can choose either, according to your preferences, and Global sells whetstones and sharpening kits that you can use on your kitchen knives. Global knives are considered among some of the best kitchen knives. 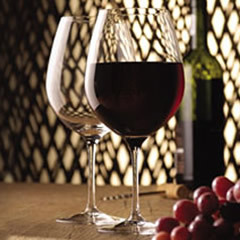 They are popular with professional and commercial chefs, as well as keen home cooks. Their unique CROMOVA 18 steel is prized because it is lightweight but durable, while the hollowed out, sand filled design of the knives helps ensure that the pieces in our Global knife set sale are comfortable to hold and highly effective for cutting, slicing, dicing, and chopping a whole host of ingredients. 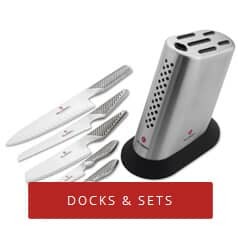 At ECookShop, the official website of Dawson's Department Store, we are proud to offer an extensive range of Global kitchen knives and other Global products. These products benefit from the company's CROMOVA 18 uniquely formulated steel, with sharp blades and lightweight handles. Buy a Global knife sharpener and sharpening set to help maintain the high quality of the blade. 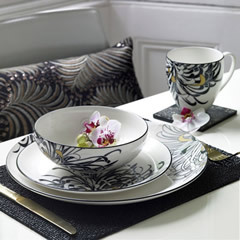 If you spend more than £50 at ECookShop, we will deliver your UK order free of charge. We use a reputable and reliable delivery service to ensure that your products arrive on your doorstep in the same condition that they left the store. 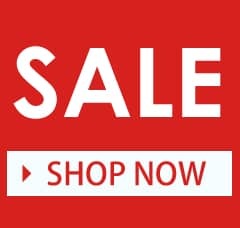 If you're looking to take your preparation and cooking to a new level, enjoy our competitive prices and discounts offered as part of the ECookShop Global Knives sale and buy today.